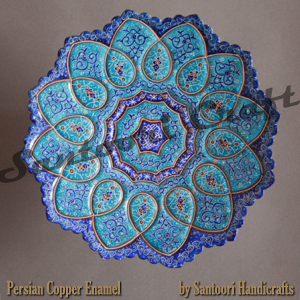 Santoori Handicrafts tries to create a new way to look at Persian handicrafts. 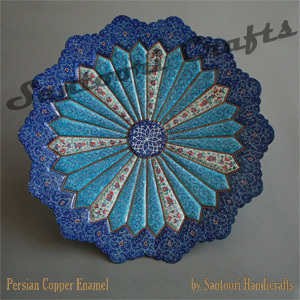 Persian Enamel Copper is the focus of the following page. The art of Enamelling on Gold, Silver and Copper is compounded with Persian miniature painting as the decoration of metal and tile with Mina (blue) glaze. Iranian Enamelling is the art of painting, colouring and ornamenting the surface of metals by fusing over it brilliant colours that are decorated in an intricate design. It is very difficult to supply evidences of the enameling in Persian art history. But some experts link the historicity of enameling in Iran to the Arsacides and Sassanid periods. However, the use of this art in the Islamic period is not clear before the reign of the seventh ruler of Mongol empire’s Ilkhanid division in Iran,Ghazan Khan (694-703 AH) who introduced Mongol Persia to Islam. We here publish some master exsamples of Mina Enamel Copper. Santoori process advanced special orders too. Interested into Persian Vitreous Enamel? Here you can find useful info about Minakari Persian Enamelin Art.